Let Hot Table help you make shopping easy… all year long. 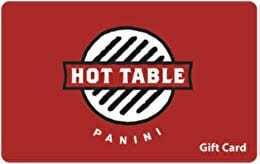 You can purchase a gift card at any Hot Table location or order online and have one sent out to you or that special person. Need a gift now? Hot Table eGift Cards can be personalized and delivered via email or text in minutes for a gift they won’t forget. Have a real Hot Table gift card that includes a personalized greeting card mailed out to that someone special.